No other city in Asia may have been deflated more quickly by the global recession than the Chinese gambling mecca of Macau. After the local government opened the gaming business to new casino operators in 2002, the former Portuguese colony (population 540,0000) boomed as billions of dollars of investment poured into new hotels and casinos and newly wealthy Chinese crowded baccarat and blackjack tables. But the good times came to a sudden end in late 2008 as the credit crunch paralyzed global financial markets. Gaming revenues sank and casinos laid off staff. Sheldon Adelson, chairman of casino operator Las Vegas Sands, was forced to halt his $12 billion plan to build an Asian version of the Las Vegas Strip on a stretch of reclaimed land called Cotai due to financing woes. The boomtown went bust. But as Asia's economy starts to pick up steam, Macau looks to be on another roll. Gambling revenues surged an estimated 17% in August from a year earlier to $1.4 billion, a record monthly total. Aaron Fischer, gaming analyst at brokerage CLSA in Hong Kong, expects the revival to continue. September's revenues could surge 25% or more, he says, and he sees at least "low teens" growth rates annually from 2010 to 2012. "You can put me on record saying Macau is back," Fischer says. Reflecting this renewed optimism is the buzz surrounding upcoming initial public offerings by two Macau casino operators. Las Vegas casino titan Steve Wynn, who opened the Wynn Macau luxury hotel and casino in the city in 2006, plans to offer 25% of his Macau operations in an IPO on the Hong Kong stock exchange. The IPO could raise as much as $1.6 billion; the shares are expected to start trading on Oct. 9. "With this IPO, we're a Chinese company with Chinese ownership," Wynn said, adding that the move would help management "assimilate ourselves with China more efficiently." Also preparing to spin off Macau operations through an IPO is Adelson's Las Vegas Sands (LVS), although the company has yet to provide any specific details of the offering. Adelson in 2004 was the first Vegas mogul to open a Macau casino; his business today is anchored by the giant 3,000-room Venetian hotel on the Cotai strip. Ron Reese, an LVS spokesman, says that the company is hoping to restart stalled construction on Shangri-La and Sheraton hotels in Cotai as soon as possible. Bouyed by Macau's nascent recovery, other operators are pushing ahead with new projects. On Sept. 21, SJM Holdings, controlled by long-time Macau gambling king Stanley Ho, opened the French-themed, 170-table Casino L'Arc. It is SJM's 17th casino in the city, and the company plans to launch another, Casino Oceanus, by the end of the year. In June, Ho's son Lawrence, CEO of NASDAQ-listed Melco Crown Entertainment, opened a mega-resort called City of Dreams, with a 520-table casino and a Hard Rock Hotel. An 800-room Grand Hyatt opens at the resort later this month. Wynn is also finishing a $650 million expansion of his Wynn Macau. Called the Encore, the addition, expected to open in April, 2010, includes 400 luxury suites, an expanded casino and more restaurants. 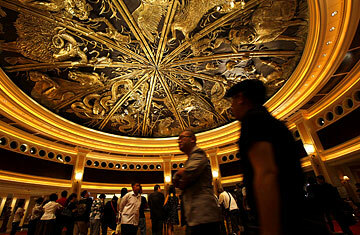 There could be many more Chinese gamblers around to fill up those new casinos. Part of the reason Macau has suffered over the past year is Chinese government policy. Aiming to cool down what was seen as an excessively heated gambling sector, government officials last year imposed visa restrictions that, at their tightest, limited some Chinese to only one Macau visit every three months. Now analysts believe those limitations are starting to ease, which would allow greater numbers of Chinese to enter the city to gamble. That prospect would be a big boost to the casino companies. During the boom years, Macau casinos minted profits at an astonishing rate, but over the past year, the recession has taken its toll on bottom lines. Melco Crown, for example, swung to a loss of $179 million in the first six months of 2009, compared with a gain of $37.5 million in the same period a year earlier. Wynn's Macau operations saw net profit sink 35% in the first half of 2009. CLSA's Fischer, however, believes the industry is set for a turnaround. Cost-cutting measures implemented during the recession, he says, will help the casinos turn bigger profits amid the recovery. "Once you see revenue recover, you'll see earnings rebound even further," Fischer says. A happier, healthier Macau is exactly what Beijing wants right now. The 10-year anniversary of Macau's handover to Chinese rule from Portugal arrives in December, and so will a new chief executive to govern the city  a perfect moment to highlight Macau's prosperity under China's control. For Macau, it looks like the chips are up.